Playing her first match as a top five player, Dominika Cibulkova will open her 2017 campaign against the world number 23, Zhang Shuai in the second round of the Brisbane International. As the number two seed, Cibulkova was granted a first round bye, while Zhang played her first match of the year on Monday. 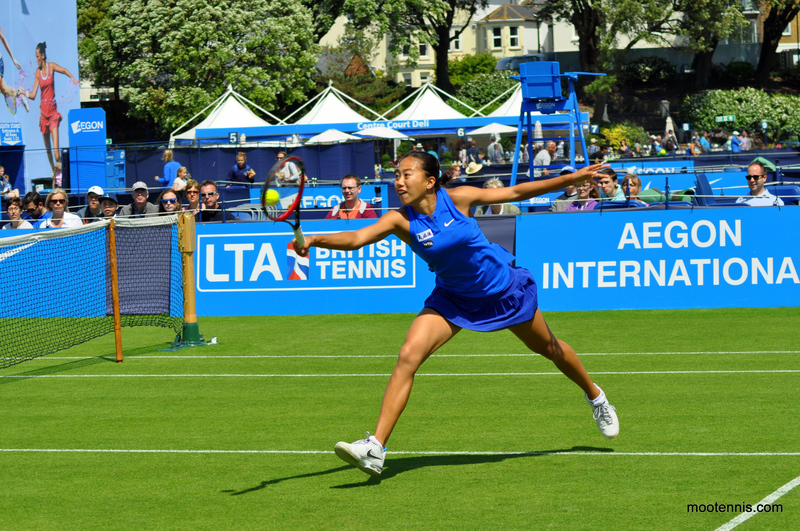 The Chinese player overcame Laura Siegemund, 4-6 7-6(3) 6-3 in a high-quality and fiercely fought first round match. The second set was an absolute rollercoaster as Zhang twice failed to serve out the set from 5-1 up. The set went to a tiebreak where Siegemund looked to be en route to the win up 3-0. However, peak-Zhang made an appearance as she reeled off seven straight points with some sensational tennis to force a decider. There was one point where Zhang produced some remarkable defence up at the net. Zhang struggles to lock in her rhythm against Siegemund's variations in trajectory, depth, & angle, but finally powers through, 46 76(3) 63. Head-to-head record: Cibulkova has won all four previous matches against Zhang (one via retirement) and has not dropped more than four games in any of the sets she has played. Interesting stat: Both players enjoyed superb 2016 seasons on tour, their best to date. Cibulkova rose over 60 places from #66 after the Australian Open to #5, while Zhang gained a whopping 162 places from the end of 2015 to the end of 2016, finishing the year with a semi-final appearance in Zhuhai and inside the world’s top 25. Final thoughts: Based on the head-to-head record, this would appear to be a straightforward match-up for Cibulkova. However, Zhang (and in fact Cibulkova as well) has come a long way since their most recent encounter in 2014. Zhang will benefit from having played a match, a hard fought one at that, and have gained some confidence having been on the ropes for a time. Cibulkova can get embroiled in some grinding three setters early on in tournaments and she arrives in Brisbane as the number two seed and one of the top players, a different situation for her that may bring more pressure and expectation on her shoulders. Cibulkova may run with it and keep building in 2017 after her magnificent triumph in Singapore, but I do believe she may be vulnerable in this first match of 2017 against a dangerous opponent who can catch on a hot streak of form. I’ll take a risk on this one… going for Zhang to cause an upset. January 3, 2017 in Brisbane, Cibulkova, WTA, Zhang. I really haven’t watched an awful lot of Zhang’s matches, so I can’t really comment on how much of a threat she’ll make to Cibulkova. Really surprised by how uniformly well the seeds have performed thus far. Still waiting for that first big upset. Could well be Dominika.